When I first set eyes on the Sony RX100 V, like many others it was its incredible 4K quality and ultra small form factor that appealed to me. BUT, I was also eyeing it up for another reason, something rather unorthodox for this little camera… Live Streaming. Although I wasn’t sure if it was actually possible, I’m happy to say that live streaming with the RX100 V WORKS and it’s freaking epic!! A full list of everything I used to make it happen is at the bottom of this post. So here was the idea: Could I get a feed from the HDMI out of the Sony RX100 V and into my MacBook Pro so that I could broadcast the image out to Periscope, YouTube and Facebook Live? Firstly, I wanted the Sony RX100 V to stay awake for as long as possible, so for that you need to make sure that you plug in the USB power. This will disable the power save mode on the camera. You then need to set the “HDMI Settings”. Set the desired HDMI output resolution (I went for 1080p) and importantly you need to make sure that “HDMI Info. Display” is set to off. This will make sure that none of the cameras on screen displays are outputted to the HDMI feed and you’ll just get a clean picture. Now that the camera is set, lets talk about getting that feed into your PC / Mac. For this I’m going to recommend two great options. The Web Presenter allows you to input a HDMI or professional SDI signal into the device, which will then downscale it to the required 720p for streaming. 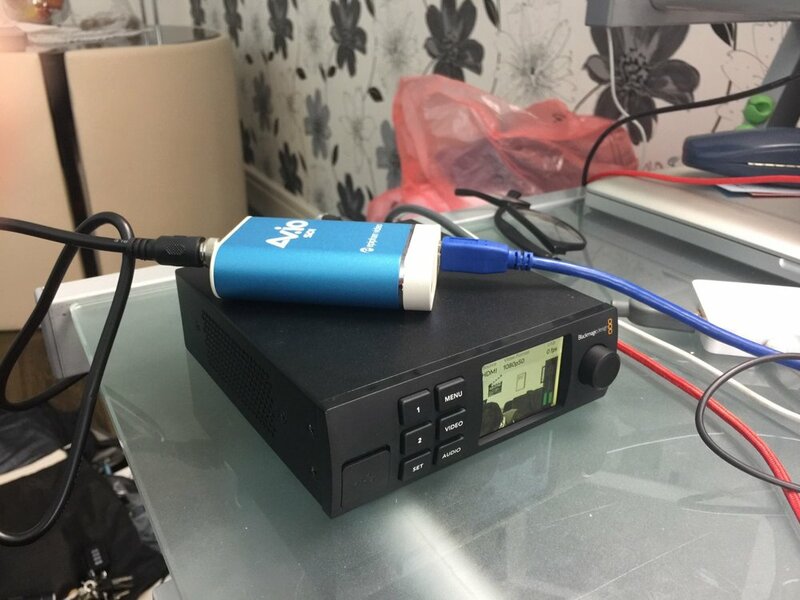 The great thing about the Web Presenter is that because all the heavy lifting is done on the device itself, it means that it can send the video & audio signal via USB 2 to your chosen computer. When you plug in the Web Presenter to your PC / Mac via USB, your computer will see it instantly, just as if it was any old web cam. This also means you can use professional grade camera for apps like Skype! Of course in this case, we’re using software like OBS to then take the image and live stream it to the world. The AV.IO is a great if you know you’re not going to be wanting to ever use an SDI feed, and just want to input HDMI. It works over USB 3.0 and similarly to the BM Web Presenter, it’s ‘plug and play’ so will show up as a webcam in may apps. It has it’s advantage as being able to support resolutions up to 4K, which is great for if you’re wanting to input and live stream the latest high quality console games. I’ve put both of these options above, because they both have their advantages. It up to you which one you choose. Ok, so now that you’ve got your HDMI camera signal from the Sony RX100 V into your Mac/PC, you can now open up OBS (or another production / streaming software) and start broadcasting using this incredible camera. 1) Right now both Periscope and Facebook Live are limited to max 720p. So don’t go thinking you can go sending a 4K feed to either of these platforms just yet. YouTube however does allow 4K live streaming. 2) Audio will be carried down from the camera, but if you have an external mic, I’d advise setting this up in OBS and syncing the audio and video. Although the on-board camera of the RX100 V is pretty good, nothing beats a good old condenser mic. 3) Although I tested a live stream of around 45 -50 minutes in length without any issues at all. Just note that the Sony’s are known for getting a little on the hot side and sometimes overheating. They’re not designed for this sort of thing, so expect to see a heat warning if you’re going to try this for long periods of time. 4) You can reduce overheating put placing the camera in MP4 Mode (@ 1080p) and leave it in standby. Don’t press record on the camera itself.